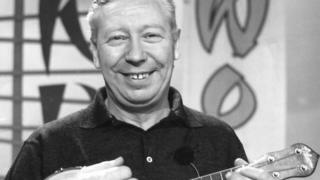 Two ukuleles used by George Formby have fetched almost £24,000 at auction after being kept out of view for years. The Lancashire comedian was known for performing with his "little ukulele" and made the instrument famous. The Keech, played by Formby in his 1935 film No Limit, and Dallas D banjo were part of Formby fan George Johnson's collection until his death last year. Mr Johnson kept most of his Formby mementos hidden under his bed and in the attic so as not to anger his wife. The Dallas D was bought by Anthony Mason, 61, from Salford, who said he hopes to hold a Formby night at his bar to celebrate. He said: "I've liked George Formby for years, since I was a boy. I even visit his grave in Warrington cemetery. "I knew the ukulele was up for sale and just wanted it." Mr Mason bought the instrument for almost £12,500 at Hansons Auctioneers, in Etwall, Derbyshire. The Keech sold for about £11,500. The pair of ukuleles had a guide price of £19,000. Claire Howell, music memorabilia expert at Hansons, said: "These are incredible instruments to own with a rich provenance and pedigree." Mr Johnson, from Gateshead, who died last summer at the age of 91, collected the memorabilia from the 1930s. Ms Howell said: "[Mr Johnson] bought the banjo-ukulele direct from the star's wife, Beryl Formby, in 1952 for £14. "He was such a huge Formby fan he owned seven ukuleles altogether and accumulated a large archive of Formby memorabilia." Some of the other items from Mr Johnson's collection, including Formby bow ties and an original script for 1942 Formby film Much Too Shy, were also sold. Mr Johnson had passed the collection, including other vintage instruments, records and photos, to his children.